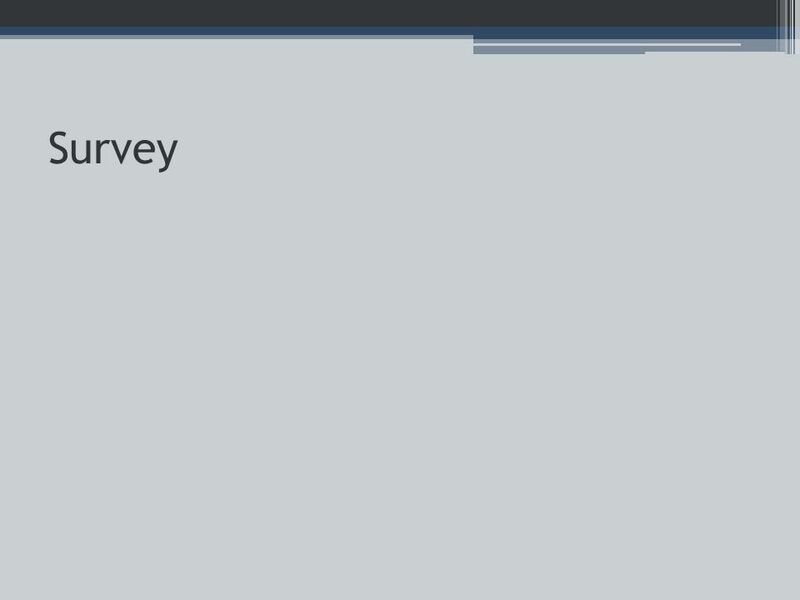 Survey. 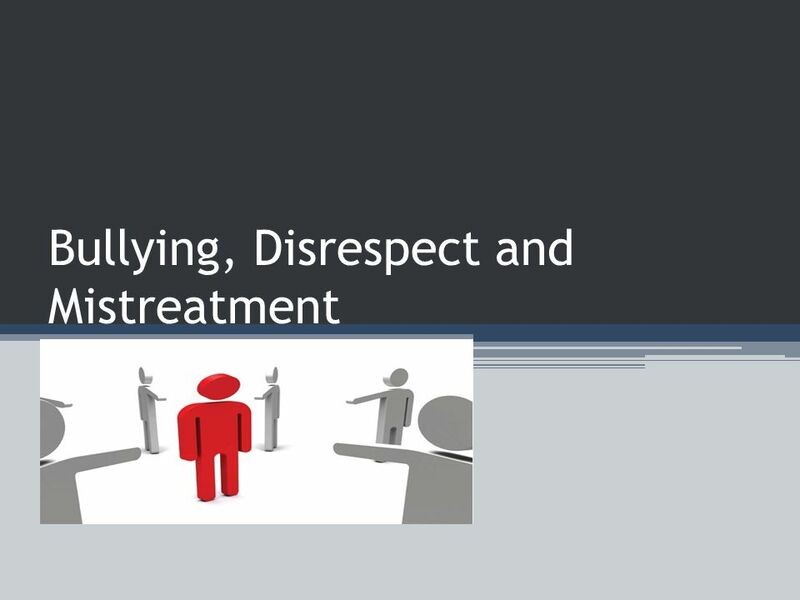 Bullying, Disrespect and Mistreatment Bullying, Disrespect, and Mistreatment When a person/group of people repeatedly and intentionally cause. 5 Why are we here to talk about this? 1.We care about the school. 2.We care about safety. 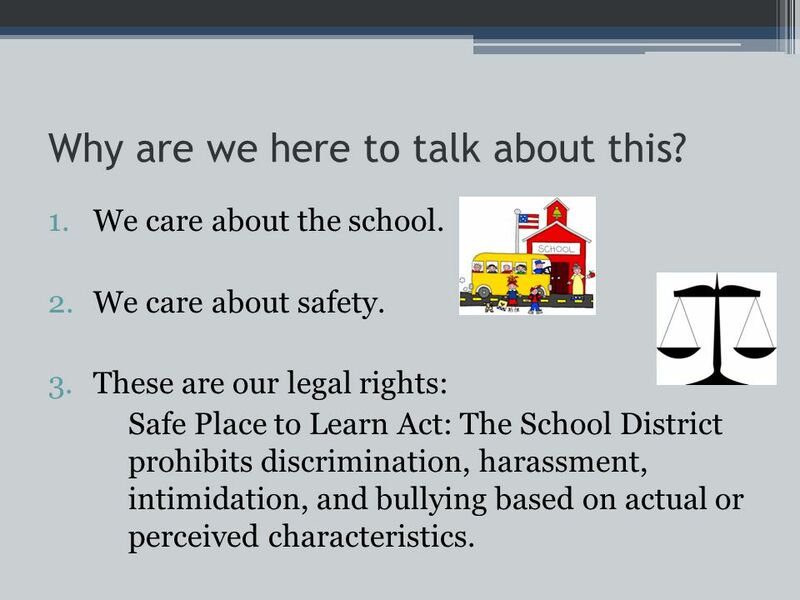 3.These are our legal rights: Safe Place to Learn Act: The School District prohibits discrimination, harassment, intimidation, and bullying based on actual or perceived characteristics. 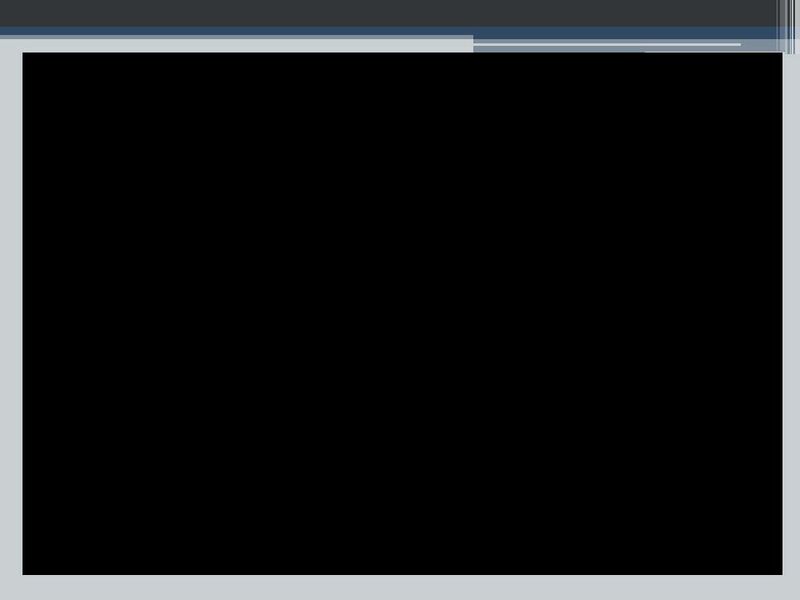 7 Question 1. 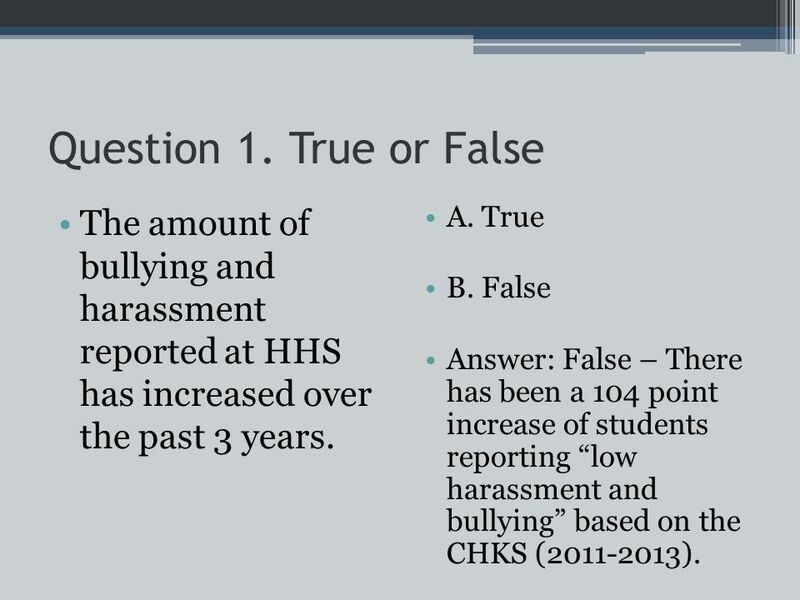 True or False The amount of bullying and harassment reported at HHS has increased over the past 3 years. A. True B. 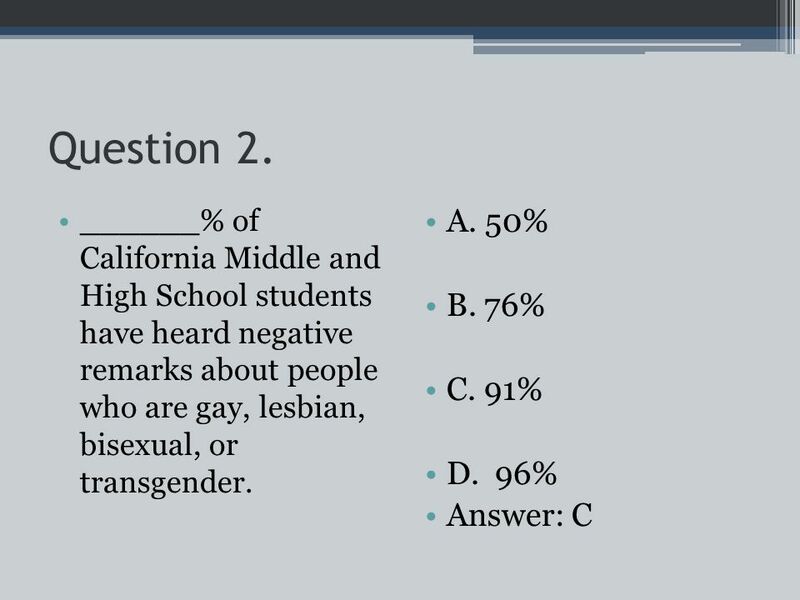 False Answer: False – There has been a 104 point increase of students reporting “low harassment and bullying” based on the CHKS (2011-2013). 9 Question 3 Sexually harassing somebody could result in: A. Being punished by the School B. Being punished by the Police C. Both of the above. Answer: C. Both of the above. 10 Sexual Harassment is unwanted: Flirting Touching Sexual Comments Sexual Rumors * Sexual harassment makes the receiver feel uncomfortable and is illegal. *We can respect each other by respecting the human body. 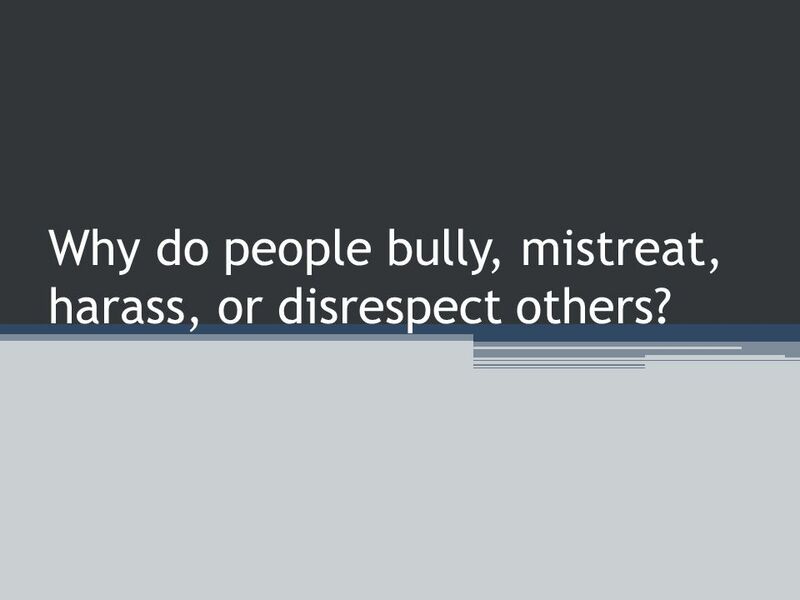 11 Why do people bully, mistreat, harass, or disrespect others? 12 In what ways are people being disrespectful? 16 The Effects of Being Bullied Low Self-Esteem: Feeling Worthless Depression: Feelings of sadness or hopelessness that lasts many days, weeks, or months. Retaliation: Doing something equally hurtful in response to what was done to you. Suicide: The act of someone thinking about or actually taking his/her life. 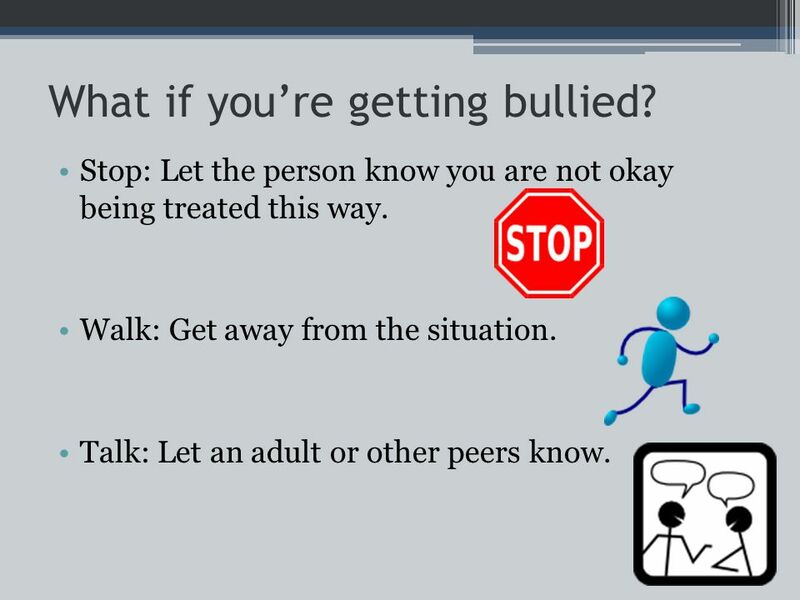 17 Bullying: What can we do to help? 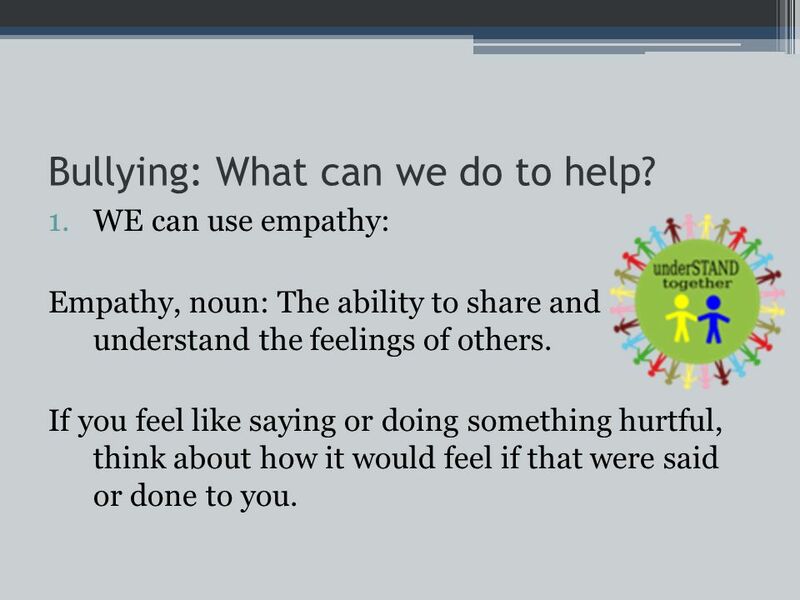 1.WE can use empathy: Empathy, noun: The ability to share and understand the feelings of others. If you feel like saying or doing something hurtful, think about how it would feel if that were said or done to you. 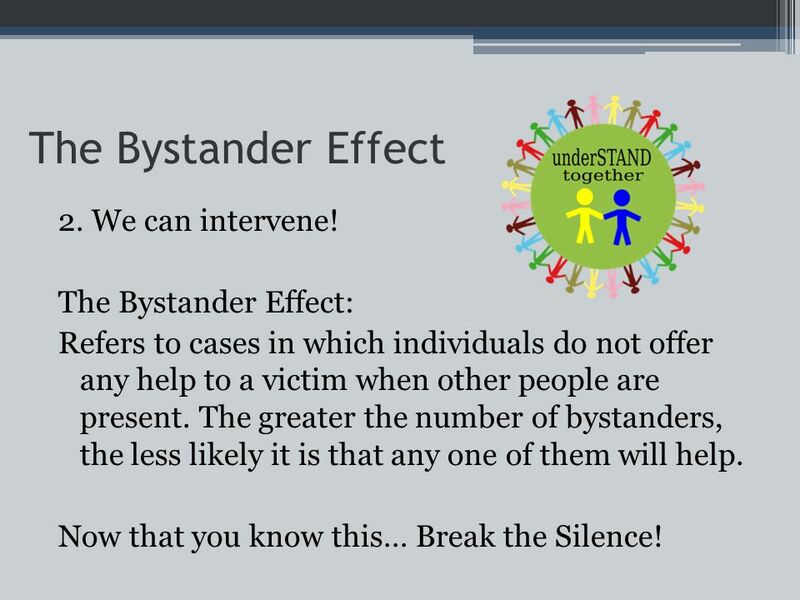 18 The Bystander Effect 2. We can intervene! The Bystander Effect: Refers to cases in which individuals do not offer any help to a victim when other people are present. The greater the number of bystanders, the less likely it is that any one of them will help. Now that you know this… Break the Silence! 20 What if you’re getting bullied? Stop: Let the person know you are not okay being treated this way. Walk: Get away from the situation. Talk: Let an adult or other peers know. 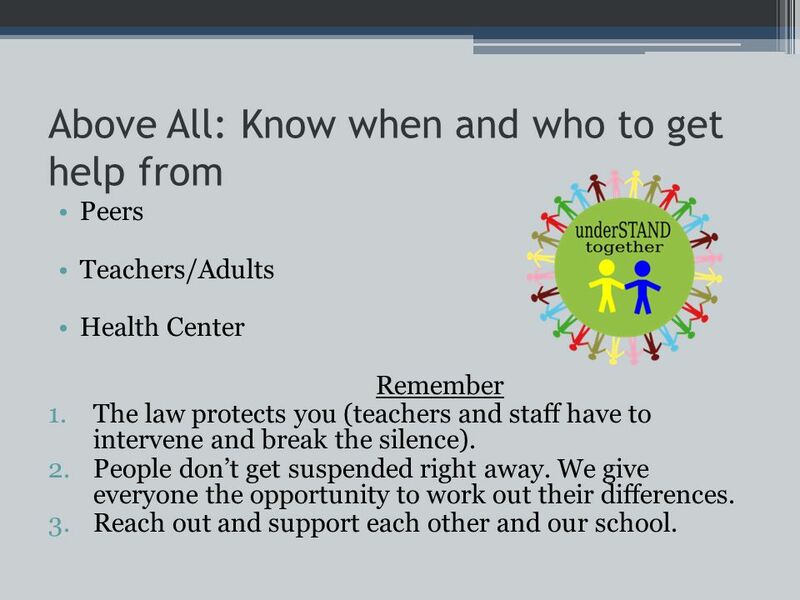 21 Above All: Know when and who to get help from Peers Teachers/Adults Health Center Remember 1.The law protects you (teachers and staff have to intervene and break the silence). 2.People don’t get suspended right away. We give everyone the opportunity to work out their differences. 3.Reach out and support each other and our school. 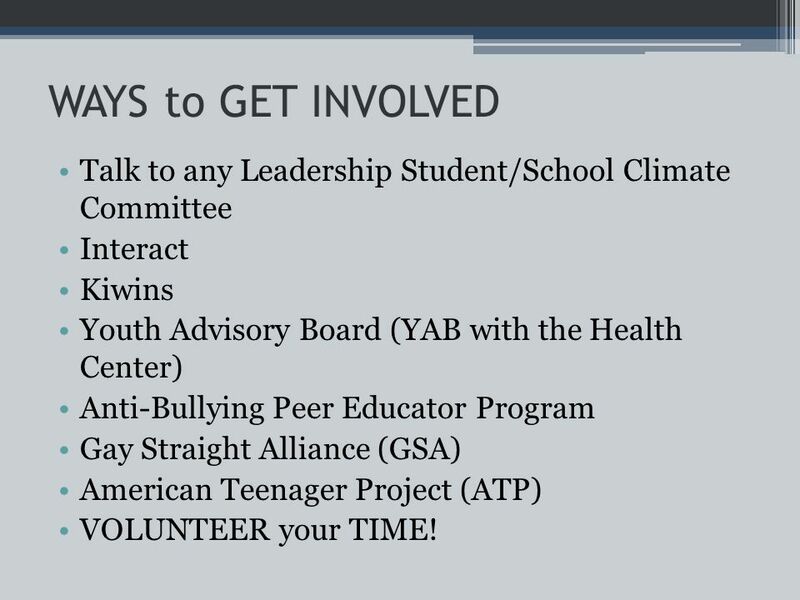 22 WAYS to GET INVOLVED Talk to any Leadership Student/School Climate Committee Interact Kiwins Youth Advisory Board (YAB with the Health Center) Anti-Bullying Peer Educator Program Gay Straight Alliance (GSA) American Teenager Project (ATP) VOLUNTEER your TIME! 23 Hercules High is … ▫(intro) ▫Personal experience ▫Audience participation ▫How many people want a place where…? 24 Resolution of Respect I pledge from this day forward to do my best to combat prejudice and to stop those who, because of hate or ignorance, would hurt people or violate their civil rights. I will try at all times to be aware of my own biases and seek to gain understanding of those I perceive as being different from myself. I will speak out against all forms of prejudice and discrimination. I will reach out to support those who are targets of hate. I will think about specific ways my community members can promote respect for people and create a prejudice free zone. I firmly believe that one person can make a difference and that no person can be an “innocent” bystander when it comes to opposing hate, I recognize that respecting individual dignity, achieving equality and promoting intergroup harmony are the responsibilities of all people. 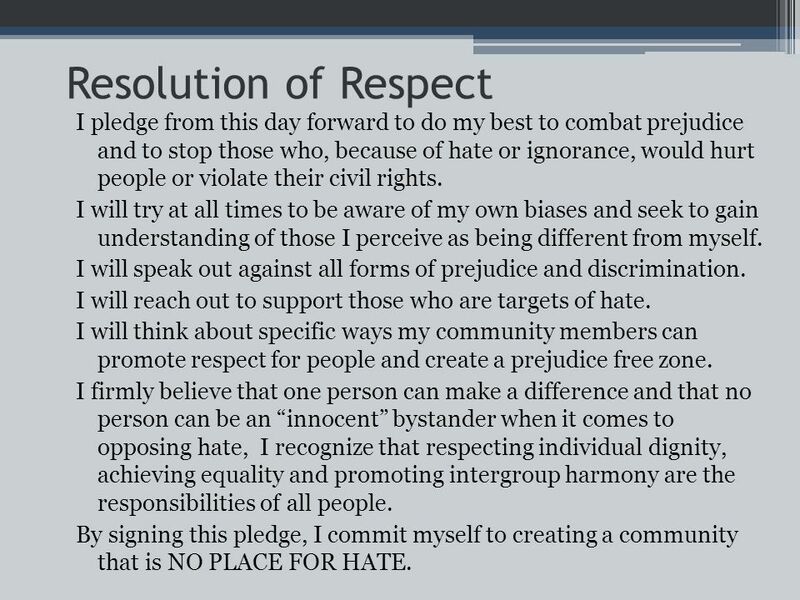 By signing this pledge, I commit myself to creating a community that is NO PLACE FOR HATE. Download ppt "Survey. 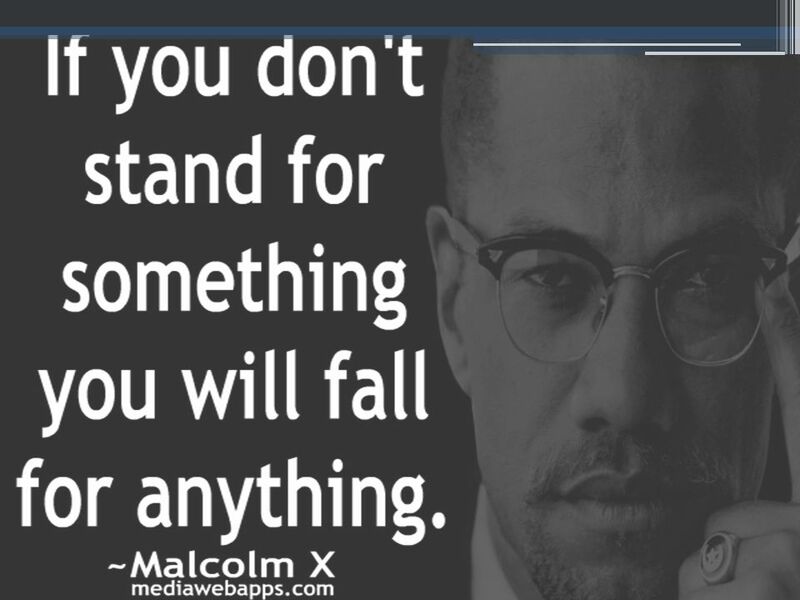 Bullying, Disrespect and Mistreatment Bullying, Disrespect, and Mistreatment When a person/group of people repeatedly and intentionally cause." 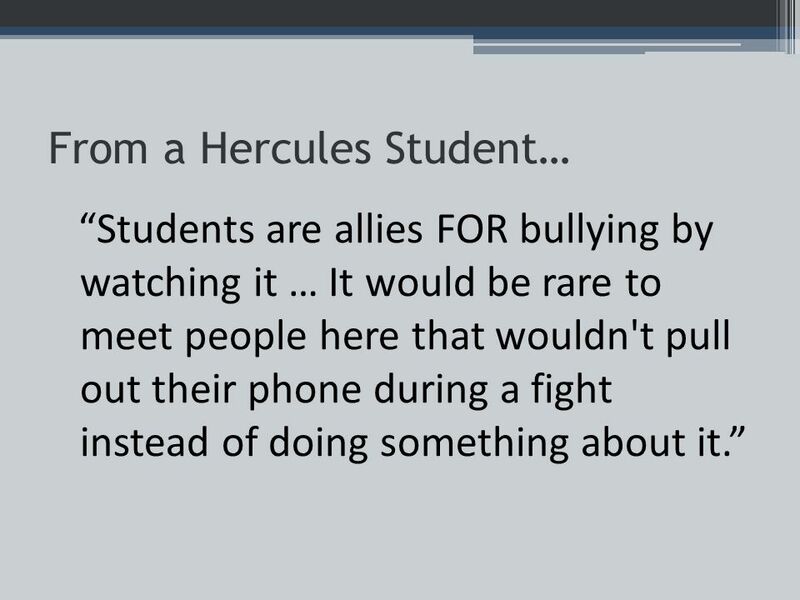 W-SR Junior High School Student to Student Bullying / Harassment. Responding to Bullying. Texas House Bill 1942 O Texas House Bill 1942 was passed to address how schools must make their campuses safer for all students. 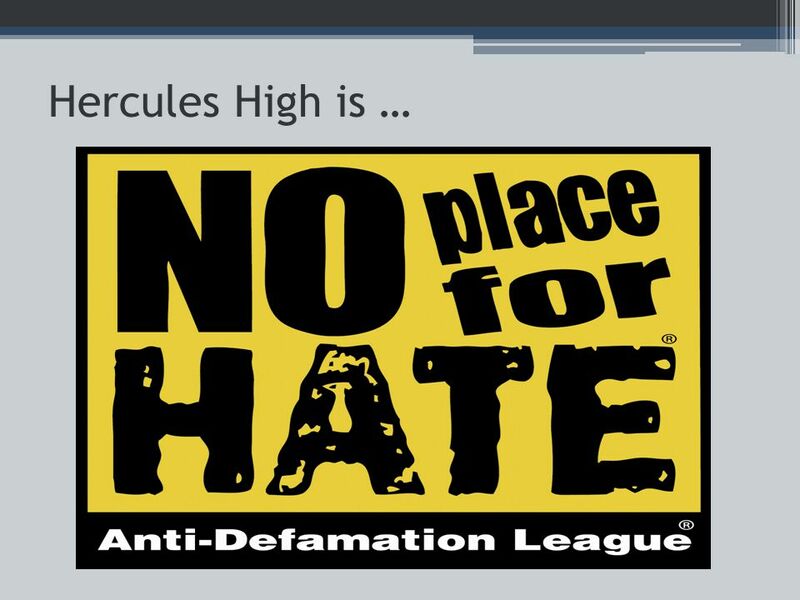 Harassment & Abuse in the High School Environment Presented by: Andy Yeager… Stephanie Mulfinger, LCSW Coordinator, Bergen County Traumatic Loss Coalition. Bullying Awareness Freshman Assembly October 6, 2010. Everyone has the right to attend a school that is safe and respectful. Student’s responsibility: I commit that I will not bully. I will report bullying. Journal Explain in your own words what abuse is. 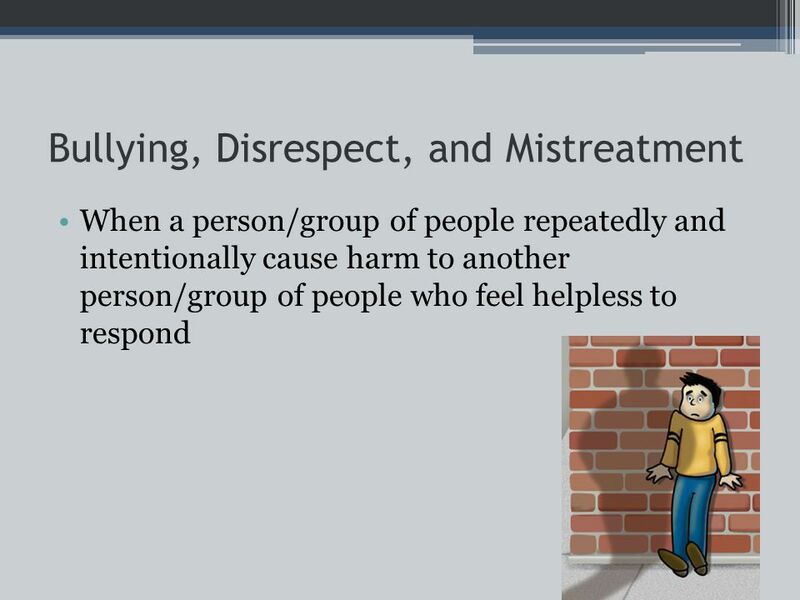 WHAT IS BULLYING? 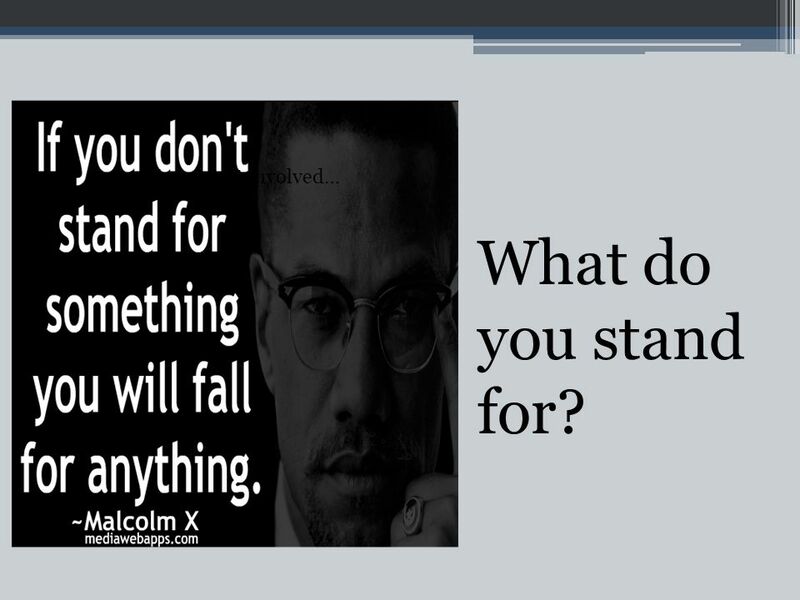 AND I want to thank each of you who are taking the time to watch this presentation. 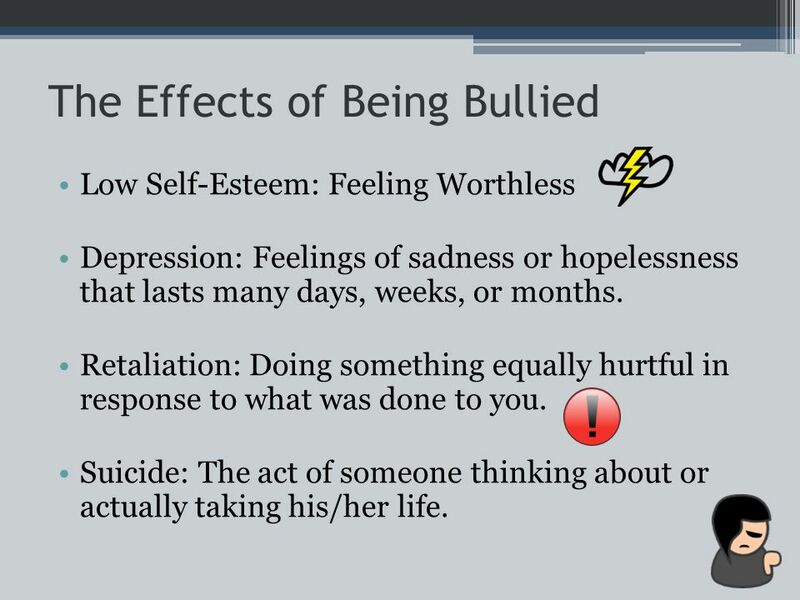 Bullying is one of the biggest challenges facing. 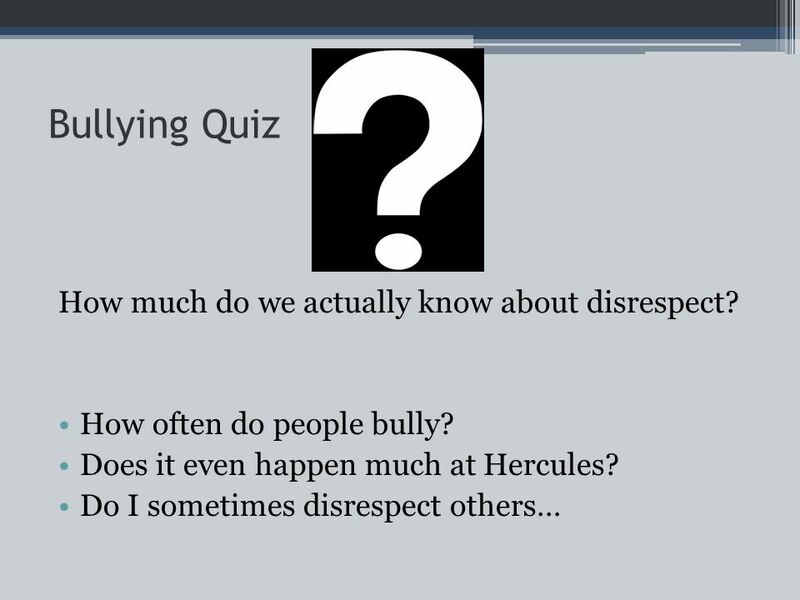  Entry Task Questions  Do you think bullying is a problem at our school? Why or why not?  Do you think that social media ( facebook, twitter, snap. 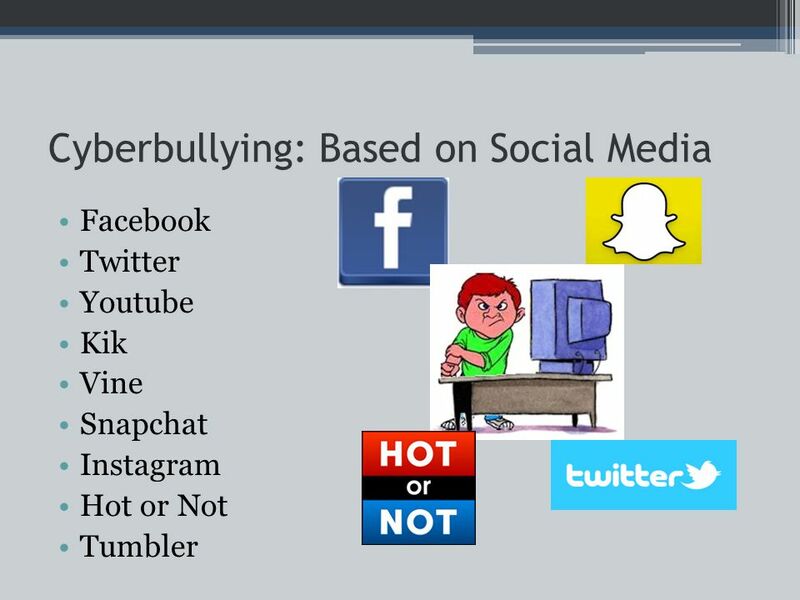 Cyber-bullying and Internet Safety. 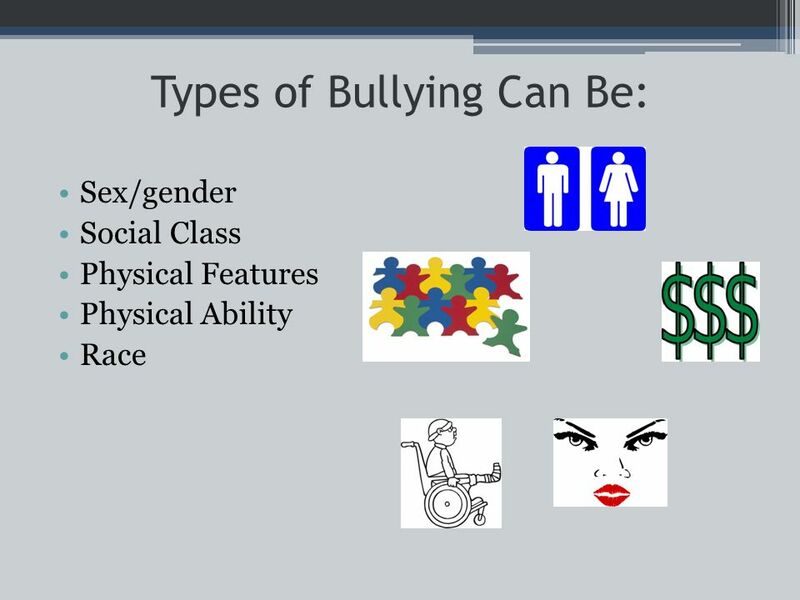 What is Bullying?  Intentionally causing harm to others  Verbal harassment  Physical assault  Exclusion from a.
PRESENTER: NAME OF PRESENTER RespectED: Violence & Abuse Prevention. Halewood Academy Anti Bullying Assembly.  At Halewood Academy, we take the issue of bullying seriously. Bullying is unacceptable.  We are a TELLING. 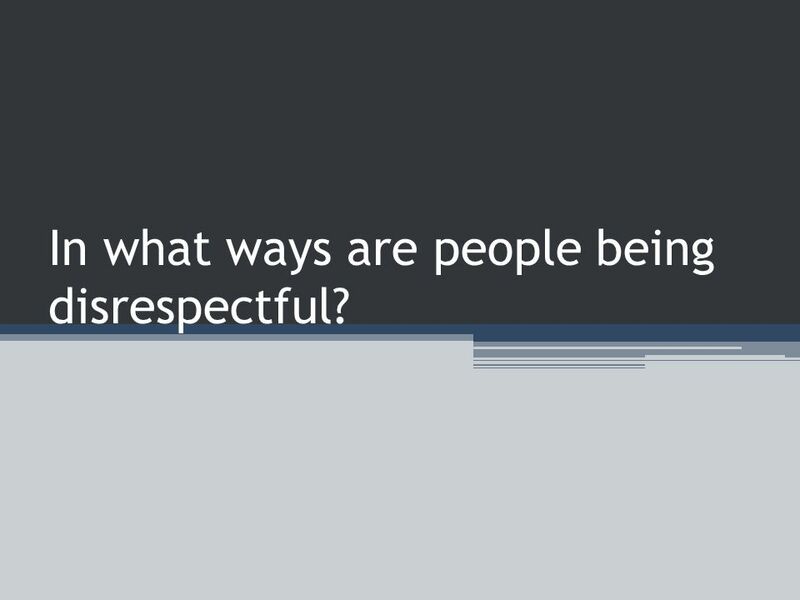 RESPECT  What is RESPECT? How do you define it? How do show your respect to you friends, teachers, coworkers, adults, etc.?  Respect is thinking and. Do unto others as you would have them do to you..